Introducing the new Bosch Blue GLM 150 C laser measurer with camera viewfinder and colour 2.8” IPS display. 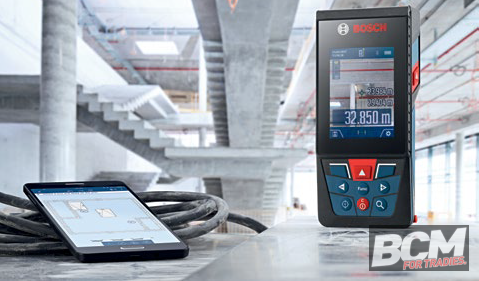 The Bosch Blue GLM 150 C has Bluetooth connection to transfer the data to your smartphone or tab via the Bosch Blue Measuring Master app. The Measuring Master application allows the documentation of construction projects easily and efficiently. Optimised for smartphones and tablets, this application helps you to digitally record, manage and process measured values. You can also create and save new projects and easily add your measurements as you work to save and review in the future. The camera viewfinder with x3 zoom helps to precisely target outdoors at long distances – easy and convenient indoor and outdoor measuring of up to 150m with accuracy 0.15 mm/m. The robust anti-scratch screen glass will survive anything on the jobsite. The Bosch Blue GLM 150 C has all the necessary functions a tradie needs: area, volume, constant, indirect measurements and even angle measurement and digital levelling! The ¼” tripod thread and multiple measurement reference make the tool versatile and suitable for all projects. The laser measurer is lightweight at only 0.23kg and compact in size for simple access on the go, with splash protection of IP 54 and a laser diode of 650nm, <1mW. The GLM 150 C includes 3 x AAA batteries and an accessory set. Available at Total Tools and Blackwoods: RRP $399.